Overview and features for House in Serignan, 4 km from beach in Languedoc-Roussillon. The house is situated in the heart of the small town of Serignan, near Beziers, Languedoc. Serignan is a lively town with its central square and many restaurants, cafes and open air markets. It is surrounded by vineyards, the Canal du Midi and the Mediterranean Sea, with kilometers of white sandy beaches and small roads winding through the vineyards, perfect for cycling. 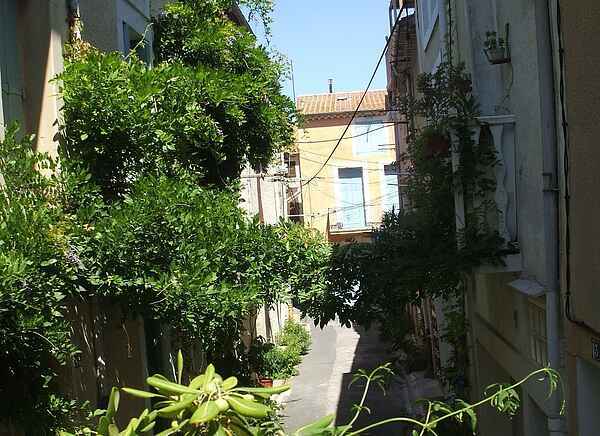 The house, located in the heart of Serignan old town, comprises of 3 levels: -level 1: kitchen and living area -level 2: 2 bedrooms, one with a double bed, the other one with bunk beds, and a bathroom -level 3: a room which can be used as a bedroom (2 single beds) or a living area, opening onto the roof terrace which looks over the roofs of the old town. looking over an old fashioned quaint street of the old town. From the terrace at the top view over the roofs of the old town. Location of this holiday home is in Languedoc-Roussillon, France. -Beautiful beaches : Serignan Plage, Valras, Portiragnes -Easy access: efficient and cheap public transport to the beaches and to Beziers -Canal du Midi, perfect for walking, cycling, fishing, boating. -Lots of cafes, restaurants, shops, markets -Summer festivals ( ferias, open air concerts, boules...) -Cycling lanes and small roads through the vineyards -The city of Beziers, old medieval town with its famous 9 locks on the Canal du Midi Map and distances for Serignan holiday townhouse rental. Supermarket/Shop: 100 m Restaurant/Pub: 100 m Beach: 4 km Beziers-Cap D'Agde Airport: 10 km Golf Club: 12 km. Accommodation for Serignan holiday townhouse rental in France. First floor: Kitchen with balcony looking over the street and living area Second floor: one double room, one twin room (bunk beds), bathroom Third floor: top room with 2 spare beds, opening onto roof terrace. Outside Area:10 sq meter terrace on the top floor, looking over the roofs of the old town, with garden furniture, barbecue and sink.